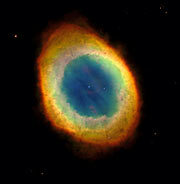 The ring nebula, M 57, a planetary nebula. Most of the light and radiation we can observe in the Universe originates in stars – individual stars, clusters of stars, nebulae lit by stars and galaxies composed of billions of stars. Stars are spheres of glowing hydrogen and other chemical elements which produce their prodigious energy output by converting lighter elements to heavier ones through nuclear processes similar to those in hydrogen bombs. Like human beings they are born, mature and eventually die but their lifetimes are vastly longer than our own. Hubble has gone beyond what can be achieved by other observatories by linking together studies of the births, lives and deaths of individual stars with theories of stellar evolution. In particular Hubble’s ability to probe stars in other galaxies enables scientists to investigate the influence of different environments on the lives of stars. This is crucial in order to be able to complement our understanding of the Milky Way galaxy with that of other galaxies. Another area where Hubble’s work has been widely acknowledged is the linking of star formation with stellar evolution. Hubble's infrared instruments, WFC3 and NICMOS, are capable of looking through the dust clouds surrounding newly born stars. Some of the most surprising discoveries so far have come about by peering through the clouds of dust surrounding the centre of our Milky Way. Astronomers found that this centre, which was thought to be a calm and almost 'dead' region, is in fact populated with massive infant stars gathered into clusters. 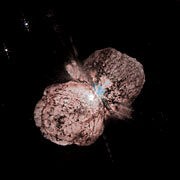 Eta Carinae, a star system repeatedly observed by Hubble in the 1990s, is highly unstable and a prime candidate for a supernova. The dumbell-like shape is material ejected in a major outburst in the mid 19th century. The last phases of solar-like stars have been investigated through observations of planetary nebulae and proto-planetary nebulae. These are colourful shells of gas expelled into space by dying stars. The varying shapes and colours of these intricate structures with different colours tracing different, often newly created, chemical elements, have shown that the final stages of the lives of stars are more complex than once thought and there also seems to exist a bizarre alignment of planetary nebula. Hubble was the first telescope to directly observe white dwarfs in globular star clusters. White dwarfs are stellar remnants and provide a ‘fossil’ record of their progenitor stars which shone so brightly that they long ago exhausted their nuclear fuel. Through these measurements it is possible to determine the ages of these ancient clusters which is an important cosmological tool. Supernova 2004ef, in galaxy UGC 12157, captured by Hubble. Most scientists today believe that the expansion of the Universe is accelerating. This result came from combined measurements of remote supernovae with most of the world’s top-class telescopes, including Hubble, and it was a very surprising one. Hubble has given these supernovae measurements an added precision, mostly due to its high resolution. Supernova 1987a, captured by Hubble’s Advanced Camera for Surveys. When the first nearby supernova for centuries (Supernova 1987A) exploded in the Large Magellanic Cloud in 1987 it was scrutinised with every available telescope on Earth. On many occasions since its launch in 1990 Hubble has turned its gaze to the site of this unique event 150,000 light years away, and thanks to its very high resolution, it has been possible to monitor in detail the progress of the cataclysmic explosion. Hubble has seen two rings of gas on each side of the exploding star (plus one central one) which were expelled by the dying star in its last death throes several thousand years before the final explosion. In recent years astronomers have watched as different parts of these rings are hit by the blast wave from the explosion as it expands through space. GRB 110328A, an unusual flash of radiation observed by Hubble in April 2011. This may be the first observation of a star being torn apart by a black hole. Hubble is able to offer sharper visual light images than any telescope currently in operation on the ground, even if its mirror size (and hence light gathering power) is comparatively modest. This means that it is well suited to studying study stars in nearby galaxies. While most galaxies cannot be resolved into the individual stars they are made up of, the Milky Way’s neighbours, including the Magellanic Clouds and the Andromeda Galaxy (M 31, the closest spiral galaxy to the Milky Way) can now be broken down into hundreds of millions of individual points of light, and their stars studied individually. Hubble has even been able to resolve star clusters in the Andromeda Galaxy, despite it being around 2 million light years away. It has also discovered that the stars in the halo (the sparse region around a galaxy’s disc) of M 31 are significantly younger than those of the Milky Way. 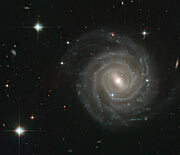 Hubble's ability to study stars in nearby galaxies is superior to any ground-based telescopes, and its ability to observe ultraviolet light (important for studying young stars) is unique. "Hubble has in my view revolutionised the study of globular clusters – especially those in other galaxies. These objects are so dense and the stars so tightly packed together that it is almost impossible to separate the stars from each other with ground-based telescopes. We have been able to measure what kind of stars they are composed of, how they evolve and how gravity works in these complex systems."